The wide variety of weaving machinery on display at ITMA allows manufacturers to create basic products through to on-trend niche fabrics and 3-D structures. The weaving and weaving preparation stands at ITMA 2015 were extremely busy throughout the entire show. The event can mainly be characterized as one that illustrated the benefits of previously developed weaving technologies, but there were some new developments in weaving and weaving preparation technologies. Germany-based Groz-Beckert KG continued to establish its presence in the drawing-in and tying-in machinery market. The company exhibited its WarpMaster automatic drawing-in machine that draws warp from a single yarn package followed by a tying-in process. Using this approach, the setting time for the weaver’s beam behind the drawing-in machine is eliminated; the use of one yarn is less complex; and the drawing-in speed is higher than drawing-in from a warp beam, especially when the warp contains different yarns of different sizes and properties. The WarpMaster is designed to occupy a minimum footprint and requires only simple training. The machine is equipped with computer system with touchscreen user interface with operator guided visualization. Groz-Beckert showed different versions of its KnotMaster automatic tying-in machines for different warp types that are capable of double-end detection from leased or unleased warps. They also are equipped with a warp end break detection system. Switzerland-based Stäubli International AG exhibited its Safir, which combines the Delta automatic drawing-in machine and the Opal automatic leasing machine. The Safir S80 was introduced for the first time at ITMA 2007 and was shown also at ITMA 2011. At the most recent ITMA, the company revealed the Safir S60. The machine already was commercialized before the show and is being used successfully in weaving mills. Recognizing the different wants for different fabric types, Stäubli offers a range of Safir versions — the S30, S40, S60 and S80. Safir machines can handle leased or unleased warp sheets. Unleased warp sheets save time at the indirect warping process stage and eliminate the lease post direct warping process. Safir S60 and S80 machines are equipped with a color management system that detects and corrects the desired color sequence. The system also includes a storage area for keeping out of sequence yarn until it is needed; and recognizes yarn structure including twist direction, hairiness and yarn denier. When yarns of similar deniers are used and the thickness measurement is not accurate, force measurement may be used to differentiate between yarns. 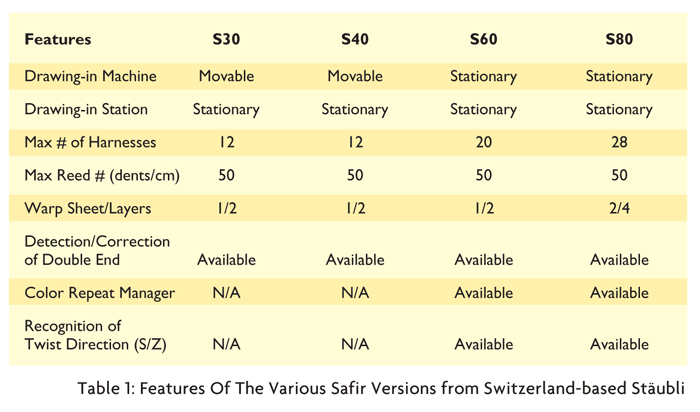 Table 1 illustrates the features of the different Safir versions. It is worth mentioning that the Safir S30 and S40 drawing-in machines are movable and can be used to service two drawing-in stations, which saves the preparation for the drawing-in setting time. The setting at the spare drawing-in station is handled while the drawing-in is conducted at the active drawing-in station. In general, the setting time for preparation for drawing-in may be longer than the drawing-in process itself, and thus having two drawing-in stations is almost equivalent to having two stationary drawing-in machines along with their drawing-in stations. The S30 and S40 machines are suitable for plants requiring frequent style change and/or a high number of weaving machines. Global competition requires continuous innovation and product development, which in turn requires samples and prototypes for evaluation prior to production. Traditionally, woven fabric producers used wide production weaving machines to produce small samples. This method leads to a loss of production and significant raw material waste. To overcome this problem, machine manufacturers have developed weaving equipment dedicated to sample and small order production. Taiwan-based CCI Tech Inc. specializes in sample warpers, sizing winders and dobby weaving equipment. At ITMA 2015, the company showed a broad range of its sample machines including the Mini Lutan sample warper, which is a smaller version of the Lutan v3.6 — which produces warps with lengths of 11 to 200 meters — and the Lutan v5.0 — which produces warps with lengths of 15 to 500 meters. The Mini Lutan offers automatic color change with leasing at the beginning and end of a warp and is capable of producing warps up to 30 meters in length. CCI Tech also showed a single rapier jacquard sample weaving machine in two versions — the Evergreen J500 and J900 capable of weaving fabrics in widths of up to 500 and 900 millimeters (mm), respectively. 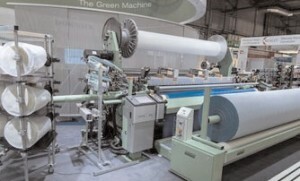 The company also exhibited a single rapier terry sample weaving machine in two versions — the Evergreen 500 and 900 capable of weaving fabrics of widths of up to 500 and 900 mm, respectively. Its sample machines are supplied with integrated controllers and CAD systems with a user-friendly interface for weave and pattern creation. Germany-based Lindauer Dornier GmbH exhibited a total of six rapier and air-jet weaving machines — four on its own stand, one at the Stäubli booth and one on Belgium-based Bonas Textile Machinery NV’s stand — weaving a diverse range of fabrics for apparel, home textiles, and industrial textiles. One of Dornier’s highlights is the new generation positive rapier P2 Type TGP 6/S G18 machine, which soon will be commercialized. It was shown weaving heavy construction filter fabric from a two-beam polypropylene (PP) monofilament warp in a width of 320 centimeters (cm) at 240 picks per minute (ppm), or a filling insertion rate (FIR) of 770 meters per minute (m/min). The features of the P2 model include 5 tons or 5,000 kilograms (kg) of beat up force that is required for heavy tight fabrics, a separate SyncroDrive motor for dobby, electronic let-off motion and electronic take-up motion. Dornier’s P2, TGP 6/S G type rapier weaving machine with a nominal width of 320 centimeters was weaving a high-density filter fabric during ITMA 2015. The company showed three P1 rapier machines weaving upholstery and womenswear fabrics, as well as carpet and tapestry using a Bonas jacquard mounted directly on the loom frame with a separate drive. Two A1 air-jet machines were shown weaving menswear and seamless air-bag fabric using a Stäubli jacquard featuring a separate drive. Mounting the jacquard directly on the loom frame eliminates a massive gantry and hence the need for a high ceiling. The separate jacquard drive eliminates the complex coupling of the weaving machine and jacquard head — a trend that was pioneered by Stäubli. Germany-based GITEC Grosse Internationale Technologie GmbH (Grosse) continued to expand the application of its Unished 2 jacquard machines. At ITMA, the Unished 2 was shown on a Japan-based Tsudakoma Corp. water-jet machine weaving a seamless side air-bag fabric from a high tenacity polyamide yarn provided by Wichita, Kan.-based Invista. The 12,672 warp yarns were individually controlled using actuators. The water-jet machine was running at 700 ppm over a width of 280 cm for a FIR of 1,960 m/min. Italy-based Itema S.p.A. showed six of its rapier and air-jet weaving machines producing a range of fabrics for apparel, home textiles and technical textiles. Two of the machines belong to the new generation R9500 rapier machines. One model, the R9500p, was weaving a 180-centimeter-wide denim fabric at 750 ppm using a Stäubli 3060 dobby; and the R9500terry was shown weaving terry towels over a width of 234 cm at 550 ppm using a 2,688 hook Stäubli jacquard with independent drive. Two additional R9500 machines were demonstrated at Itema’s headquarters showroom — one was weaving a 520-cm-wide coating fabric using a Stäubli 3020 dobby; the other was weaving a 271-cm-wide seamless air-bag fabric using a Stäubli LX 3202 jacquard. The features of the new R9500 include: a sturdy frame for low vibration at high speeds a reduced footprint; beat-up motion with high force; quick style changes such as quick beam release and single support template for quick change if needed; harnesses are closer to the reed for quick shed formation and increased speed; longer beat-up stroke allowing high beat-up force; and separate electronic let-off and take-up motions. Italy-based P.T.M.T. S.r.l. (Panter) showed six machines at ITMA 2015 — two Maxi, two Hercules and two Unirap — weaving versatile fabrics for apparel, home and technical textiles. The Unirap machines are single positive rapier. At the show, a Unirap 160, which is in the prototype stage, was weaving fabric using 3-mm-wide PP tape in the warp and weft directions with a side withdrawal weft feeder with a rotating package to keep the tape flat without adding twist. The weft feeder is a Panter development that is comparable to Greenville, S.C.-based Izumi International Inc.’s WF-510 no-twist weft feeder, which is capable of handling tapes and fiber tows of up to 20 mm wide. Izumi indicated that its weft feeder is limited to 1.7-meter-wide machines running at maximum speed of 300 ppm. The other Panter machine on display at ITMA was the Unirap J 190 shown weaving upholstery jacquard fabric. The advantages of a single rapier include elimination of weft transfer and associated mechanical settings, elimination of weft tension variation during transfer, and the ability to weave virtually any type of weft yarn. However, the weaving speed and FIR of single-rapier machines are much lower when compared to double-rapier machines. The two double-rapier Hercules machines — one Hercules 320 and one Hercules 550 — were shown weaving technical textiles for filtration and geotextiles respectively. Hercules machines offer quick changes of 20 to 30 minutes from positive to negative rapier — a Panter specialty; the ability to handle a variety of weft yarns with linear density ranging from 10 decitex (dtex) to 48,000 dtex; and high beat-up force up to 10,000 Newtons per meter or about 500 kg for a 5-meter-wide machine, which allows construction of tight fabrics for industrial applications. One double-rapier Panter Maxi 190 machine was weaving shirting fabric, and a Maxi 230 was demonstrated weaving fancy a womenswear fabric. The MAXI 230 is able to handle a broad range of weft yarns from drastically different yarn types. Belgium-based Picanol Group exhibited a total of 12 air-jet and rapier machines — 10 machines at its own booth and two machines at the Bonas and Stäubli booths. The machines were demonstrated weaving a range of fabrics including shirting, denim, terry, heavy filter, lining, automotive and intricate patterned jacquard fabrics. Picanol introduced the OptiMax-i rapier, TerryMax-i rapier and Terryplus Summum air-jet machines with new and improved features. The OptiMax-i machines are available with width range of 190 to 540 cm, which competes with projectile widths. One OptiMax-i 4-P 540 was running at 280 ppm with a warp width in reed (WIR) of 491 cm — 1,375 FIR — producing a technical textile fabric. Picanol Group’s OptiMax-i 4-P 540 is suitable for technical textile fabrics. Picanol introduced a new development in rapier design termed Free Flight Positive Gripper (FPG). In traditional rapiers, grippers are opened and closed mechanically by fingers located at the transfer area. The timing of the opening and closing of the grippers is set and fixed before weaving. This poses a challenge when using different filling yarns that require different timing. In such situations, the timing of opening and closing the grippers must to be optimized to work with the different weft yarns, a matter that requires time and leads to a loss of production. The opening and closing of the FPG rapier grippers are controlled electronically and can be timed differently for each filling type, which provides new opportunities to mix virtually any combination of filling yarns in the same fabric. At ITMA, the FPG was introduced on the new OptiMax-i 8-J 190 machine weaving an intricate jacquard pattern with variety of weft yarns supplied from eight different feeders. While Picanol successfully demonstrated the FPG technology at the show, it is not yet commercialized. It is worth mentioning that in this set up, a PES tape was fed from stationary package —over-end withdrawal — which caused the tape to twist. Zero twist in this case was not a requirement. 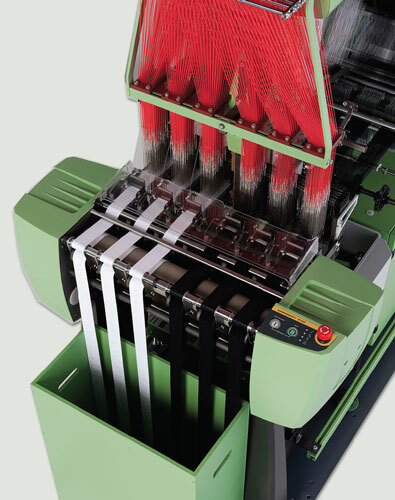 If zero twist is required, a second weft feeder is used to remove the twist from the tape prior insertion. The approach of using two weft feeders for tape insertion provides high speed and productivity compared to using a side withdrawal technique. Picanol also showcased an improved version of its pick repair automation (PRA) for air-jet machines. The new PRA II Plus is available on Omniplus Summum machines and also can be installed on previous Summum machines. A rotating pneumatic clamp with suction chamber is used on the PRA II Plus to extract the defective weft in less than 15 seconds, which is much faster than the previous-generation model. Picanol also introduced an air-jet machine system that eliminates the catch cord at the right side of the machine, which reduces raw material waste. The system features a ring jet suction device to hold the newly inserted weft yarn, then the filling is caught by clamps mounted on the reed holder that brings the yarn to the fell of the cloth where it is cut. Then the cut portion is taken by air suction to a waste container. Advantages of this system include elimination of the catch cord/selvage, catch selvage package and its holder, and catch selvage waste handling system including guides, drive, and can; and improved filling waste recyclability because it is not mixed with a different material used in the catch selvage provided that one type of fiber is used. In addition, Picanol showed an improved Adaptive Relay Valve Drive (ARVD) named ARVD II Plus. In this system, each relay valve is individually controlled, which shortens the blowing time of relay nozzles. Depending on filling yarn type, the ARVD II Plus reduced the air consumption by up to 20 percent compared to 7 percent for ARVD and 12 percent for the ARVD Plus. The ARVD II Plus is available on the Omniplus Summum and Terryplus Summum air-jet machines. Italy-based Trinca specializes in shuttle and shuttleless weaving machines with customized features based on the end-product requirements. At ITMA, Trinca showed a Fastrong T.E.M.2AR.3200 double rigid rapier machine for the first time weaving filter fabric using polyester monofilament warp and weft yarns. The machine features a rotary dobby shedding motion with individual harness control of between 2 and 52 harnesses with the option of open or closed shed, separate drives for let-off and take-up, variable speed up to 250 ppm, maximum beat up force of 3,000 deca N/m, maximum warp tension of 2,000 deca N/m, three roller take-up and warp tension monitored at four positions to maintain fabric and warp tension at desired level. These features make the machine suitable for a heavy fabric. Japan-based Toyota Industries Corp. showed new JAT 810 air-jet machines, which evolved from the JAT 710 machine. Four JAT 810 machines were exhibited weaving side-by-side bath towels at 850 ppm/2,270 m/min FIR; 170-cm-wide fancy corduroy at 1,200 ppm/2,040 m/min FIR; 190.2-cm-wide gingham shirting at 1,000 ppm/1,902 m/min FIR; and a 312.4-cm-wide pintuck curtain fabric at 700 ppm/2,187 m/min FIR. The company continues to develop its E-Shed individual harness control dobby shedding system. E-Shed is incorporated in Toyota’s terry and wide machines, which offers flexibility in the number of harnesses based on a customer’s requirements. This is a feature that cannot be found in traditional dobby motion with a fixed number of harnesses. Comparison of the traditional reed profile (left) and JAT e-Reed (right) from Japan-based Toyota Industries Corp. In terms of air consumption reduction, Toyota engineered a new relay nozzle design with an optimized tapered angle for lower air pressure. The new profiled e-Reed also reduces air pressure. The JAT e-Reed was introduced at ITMA 2011 as prototype and now is successfully commercialized. The new design of the profiled reed allows the relay nozzles to be set closer to the reed as a result of reduction in dimension of the bottom portion of the reed wires. The closer setting makes the air blowing the weft yarn more effectively with less energy dissipation. Toyota and Switzerland-based Uster Technologies AG introduced the jointly-developed ALPIN, a new adaptive control system that reduces air consumption and currently is in the prototype stage. In this system, Uster sensors are situated between the filling feeders and weft package to monitor filling yarn characteristics and airflow is adjusted accordingly. Tsudakoma exhibited a new prototype air-jet machine identified as Concept Model-190-2C-S4 running at 2105 ppm while weaving a 159-cm-wide pongee fabric. The FIR was 3,204 m/min, which was the highest weaving rate demonstrated at ITMA 2015. Such a high FIR was attained by using lightweight carbon materials for the harnesses and main shaft; incorporating a slow start/stop to absorb impact and avoid damage to loom parts, yarns and fabric; crank shedding motion; and fabric construction. While the machine is attractive in terms of productivity, it is limited to plain weaves and palin weave derivatives. Tsudakoma also exhibited the ZAX9200i Master air-jet loom, which is an upgrade of the ZAX9100 professional machine. This version possesses wider versatility according to the company. It offers various shedding motion systems; robust let-off and take-up enables weaving fabrics of varying tightness; and twin auxiliary main nozzles allow thick weft yarn insertion. Tsudakoma reports the machine can run at higher speed and consumes less power using a reduced beat-up stroke because the harnesses and reed are situated closer to the cloth fell, and a lighter hollow reed holder is used. The reduction in air consumption is achieved by using new profiled reed design and new patent-pending Auto Jet Control (JC-S), which controls relay nozzle blowing time. The machine was weaving an intricate 313-cm-wide jacquard fabric for interior applications at speed of 850 ppm/FIR 2,660 m/min. The FIR demonstrated at ITMA is a record for jacquard weaving. Schönherr Carpet Systems, a Stäubli business unit, showed its new Alpha 500. Features include width of up to 5.3 meters; ability to construct high piles of up to 14 cm; high warp density with reed up to 120 dents per cm; and up to 12 weft feeders. The Alpha 500 machine exhibited at the show was producing a carpet with 3,000,000 points per square meter/7,620 points per square inch. The Alpha 500 Leantec version is capable of producing carpets for printing and artificial grass. In addition to the jacquard head, the Unival 500 dobby with individual harness control is available for the formation of the ground weave. The Alpha 500 is equipped with two individually controlled ground beams for ground warp. The beams are located and designed to be changed from the side while the pile warp is threaded. At its booth, Stäubli displayed 3-D fabric samples featuring high-performance fibers to demonstrate the capabilities of jacquard weaving. The samples were woven on the TF20 weaving machine from the company’s Technical Weaving System (TWS) division. The samples included stitched multilayer fabrics; 3-D orthogonal fabrics; spacer fabrics; 3-D variable thickness fabrics that were net shaped; and unstitched/stitched double cloths for the insertion of equipment, or electronic or ceramic plates for ballistic protection. These woven forms are suitable preforms for composites, soft and hard body armor, embedded electronic textiles and sensors, among other applications. Belgium-based NV Michel Van De Wiele highlighted a variety of products at ITMA 2015, including its more traditional carpet products as well as machines for technical textiles and 3-D fabrics such as spacer and stitched/unstitched multilayer fabrics. According to the company, the VSi42 distance weaving machine in conjunction with the Bonas H3D offers many options for technical textile structures. Switzerland-based Jakob Müller AG — the largest manufacturer of narrow weaving, knitting and crochet machinery since acquiring Italy-based Comez S.p.A. — highlighted two narrow weaving machines at ITMA — the NHJM2 53 and the NH2 53. The NHJM2 53 6/42 z4 version shown at ITMA was equipped with an electronic jacquard shedding system driven by individual motors, eight-harness electronic dobby shedding system with individual harness control, individually controlled filling feeders, and six heads to form up to six tapes simultaneously each up to 40-mm-wide. At ITMA, the machine was running at 1,000 cycles/minutes/2,000 ppm producing elastic tape with hidden lettering that appears when the tape is stretched. A NH2 53 6/27 S2 SNO2B model needle loom also was demonstrated at ITMA. It is equipped with six heads to form up to six tapes simultaneously each up to 27-mm-wide, 16-harness dobby shedding motion with individual harness control, and electronically controlled filling feeders and fabric take-up. The machine was weaving gift ribbon with woven-in cords termed “easy bow” — so-called because of the bow’s easy formation by simply pulling on the cord. The machine was weaving six 22-mm-wide tapes at 1,000 cycles/minutes/2,000 ppm using PES monofilament, Lurex gold and silver tapes and PES monofilament filling yarn. ITMA technologies focused on the capabilities of jacquard weaving for the growing area of 3-D fabrics for automotive, aerospace, defense, and embedding electronic devices. Individual drive for jacquard and dobby, pioneered by Stäubli, is becoming the trend. Installing the jacquard directly on the loom frame to eliminate the massive gantry and need for high ceiling, which was initially implemented by Grosse, also is becoming the norm with the jacquard head dimensions matching the weaving machine width. Stäubli’s individual harness control of dobby shedding motions also is being explored by other companies. This ITMA reinforced that multiphase weaving has disappeared, marked the disappearance of projectile weaving technologies and continued the shuttle weaving comeback from Mageba. While shuttle weaving has been limited to a small number of applications such as for tubular fabrics used in medical arteries, fire hoses, endless belts and hydraulic hoses, these end uses are very specialized and profitable niche markets. Editor’s Note: Dr. Abdel-Fattah M. Seyam is a professor at Raleigh, N.C.-based North Carolina State University’s College of Textiles, Department of Textile and Apparel, Technology and Management.